Abstract: Weblogs are widely known as a technology that allows publishing textual content in reverse chronological order, often expressing the subjective points of view of a single or multiple weblog authors. The simplicity and autonomy of weblogs is assumed to play a fundamental role in their popularity and their ability to transform implicit knowledge into explicit forms. In recent years, enterprises began to experiment with weblogs to facilitate inter- and intraorganizational knowledge sharing. Although weblogs have been increasingly adopted in a corporate context, sound exploratory and explanatory knowledge and theories about weblog adoption practices in corporoate contexts are missing. A rich toolset of network-analytic techniques exists to analyze the vast amount of electronic traces produced by large weblog networks. However, in small and medium enterprises, electronic traces are sparse due to the lack of a critical amount of weblogs being maintained, and weblog communications are intervowen with offline exchanges. This requires researchers to adopt and develop new analytical techniques and concepts for advancing the state of research on weblogs. Our paper is intended to expand existing research on corporate weblogs by studying weblog adoption practices for knowledge transfer purposes in Small and Medium Enterprises. In this paper, we report selected findings from a case study in which a weblog was used to facilitate knowledge transfer in an SME. The overall contributions of our paper are deep insights into a single case of a weblog adoption in a small and medium enterprise and the formulation of a set of tentative hypothesis. 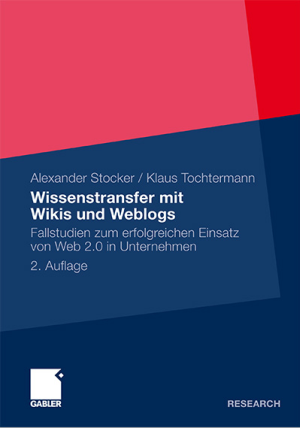 Zitat: Stocker, Alexander; Strohmaier, Markus; Tochtermann, Klaus, Studying Knowledge Transfer with Weblogs in Small and Medium Enterprises: An Exploratory Case Study, in: Scalable Computing: Practice and Experience – Special Issue: The Web on the Move, Volume 9, No. 4, 2008.